At our house we are excited when the first green blade of a daffodil plant pokes up through winter’s dried leaves. We check regularly for new blooms opening in our daffodil patch. 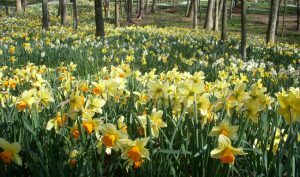 But for a really BIG dose of daffodils, we go to Gibb’s Gardens near Ball Ground, Georgia where the countryside looks like it has been painted with a big yellow brush. 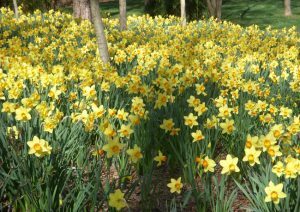 There are 50 acres of daffodils and 20 million blooms! (yes, 20 with six more zeros). What beauty to trumpet the arrival of Spring! 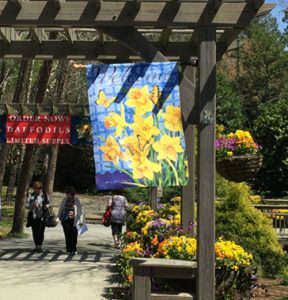 When we visited the gardens this Spring, we were delightfully surprised to see they were using the Sandy Clough “Daffodils Days” garden flags at the entrance to welcome their guests! 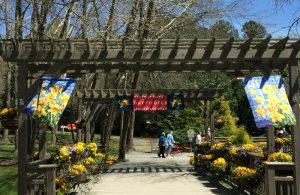 Even after the daffodils are gone, Gibb’s Gardens is refreshing place to visit—especially if you like to walk, as I do, along a creek lined with ferns or meander through a woodland Hydrangea Garden. By Summer, there is still more to see with water lilies in the ponds, roses and lilies, and a Japanese garden that segues into the gorgeous leaves of Fall.